Inspired by organic form and structure – Vertebrae Necklace #1423 is made up of an eclectic mix of antique buttons in shades of ivory and white. The necklace incorporates shimmering bronze Swarovski crystal beads which provide a beautiful and striking contrast against the worn and matte textures of the antique buttons. In dim light the Swarovski crystals catch the light in a particularly stunning way. 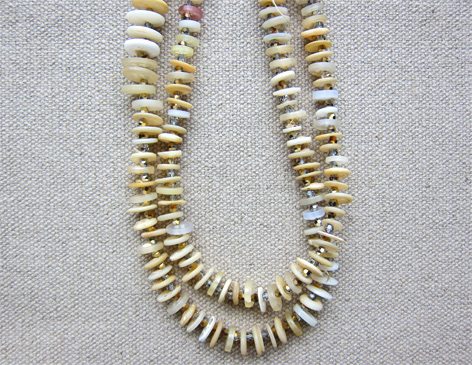 Necklace measures 24.5 inches in length when fully extended and open. Brass closure. An Erin Louise Original. Inspired by organic form and structure – Vertebrae Necklace #1424 is made up of two strands of an eclectic mix of antique buttons in shades of ivory and white. The necklace incorporates shimmering bronze Swarovski crystal beads which provide a beautiful and striking contrast against the worn and matte textures of the antique buttons. In dim light the Swarovski crystals catch the light in a particularly stunning way. Necklace measures 25 inches in length when fully extended and open. Brass closure. An Erin Louise Original. 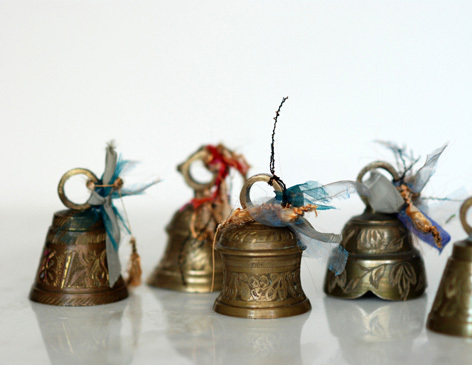 This set of 14 antique brass bells are adorned with unique handmade tassels. No two tassels or bells are the same. These bells are beautiful on a book shelf or use them individually as creative seating card holders for a dinner party by stringing names on each bell. If you plan to use them for place card holders and need more, please email and I can accommodate your requests. An Erin Louise Original.